Writing and reading about the difference between an idiom and a phrase brings this interesting idiom to mind. ‘The writing’s on the wall.’ There is scope here to discuss both idiom and phrase. The idiom and the phrase here go hand in hand as the pronoun phrase – on the wall is part of the idiom. The idiom needs the phrase to fulfil its meaning. An idiom needs a phrase but a phrase may not necessarily be an idiom. Learning about the origin of ‘The writing‘s on the wall’ helps to understand more about idioms and phrases and how do phrases play their part in idioms. The writing on the wall stems from a Biblical event when Daniel was called upon to read the writing on the palace wall written by a ghoulish severed hand with a message for King Belshazzar who was defiling holy temple goblets at his debauched parties. The writing told of eminent danger. The king did not pay attention to the written message. This idiom is now used to predict danger or failure of some sort and like all idioms contains a phrase. Idioms have their origins in all manner of events and scenarios and the phrase is an integral part of the idiom. In grammatical terms a phrase is a group of words used to define an expression. 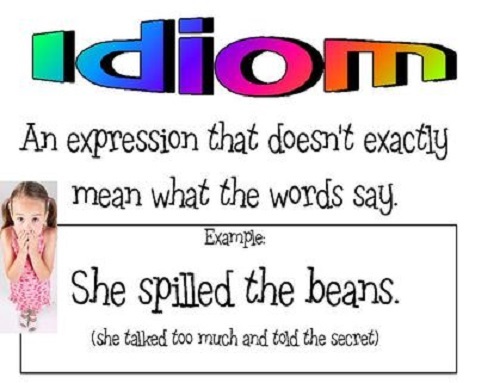 An idiom is an expression made by grouping words together to mean something that is different from the literal meaning of the phrase or saying. Phrases can be taken literally while idioms are not literal in their meaning but figurative. Idioms can also be called colloquial metaphors. Another significant difference is that a phrase is always a group of words but a single word can on occasions be an idiom. For example: moonlighting, a single word meaning something different in the way it is used and it does not have anything to do with moonlight. A phrase stands together with the words in it as a unit of speech. There are different types of phrases depending on their place within the sentence or the structure of the sentence. An idiom, containing a phrase, has a meaning that cannot be taken from the literal meaning of the words. One of the most significant differences between the two is that a phrase has literal meaning while an idiom is a figurative expression giving meaning to a phrase or conversation. How are idioms used and how do they become part of language expressions? Idioms have fixed meanings and may not be easy to understand if you are not familiar with them. Idioms give language character and interest. They are known to be obscure and challenging to the second language learner. Sometimes it can help the learner to try and relate an English idiom to a similar expression in their own language. For example someone in a foreign country may refer to some article of food appearing bigger or better than their own. An English speaking person will talk about the grass being greener on the other side of the fence. Both the expressions use something you don’t have as being a better option. This could be more relatable to someone trying to learn English as a second language. Metaphorical language helps with the meaning of an idiom. When someone is ‘fed up’ it is easy to imagine how they would feel because of the relative comparison to food and eating. It also helps to know that many idioms are based on different sources that categorise the idiom according to the genre they belong to. Animal idioms – a dark horse, be the ugly duckling, a snake in the grass. Idioms add to the informal social side of the language and share cultural and historical information. They broaden the way people learn to understand a language and show how familiar they are with the use of the language as a native speaker of the language. Idioms add depth to a language and distinguish the native speaker from the non-native speaker. There are two types of idiom that can be used in the English language, the opaque idiom and the transparent idiom. The transparent idiom is easier to understand and use. For instance to ask someone ‘to lend a hand’ is a transparent idiom and simply means to help. Then the opaque idiom is more difficult to understand as it is more obscure. For example ‘he’s pulling my leg’ meaning someone is joking with you is not as obvious in its meaning. Pulling a leg could lead to an accident and would therefore not be very funny. How are phrases used and what part do they play in the English language? Phrases are a functional part of the construction of sentences and the language needed to express opinions and dialogue. Phrases are functional and are a formal part of a sentence. There are different types of phrases that support different parts of a sentence. 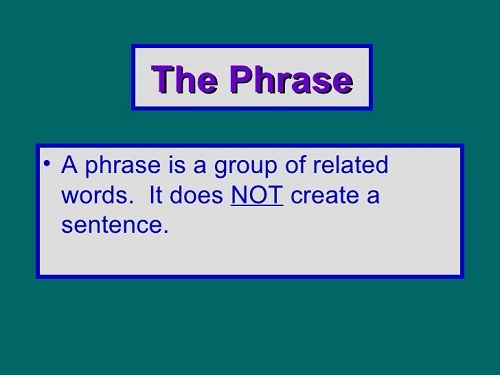 Noun phrase- the noun phrase includes a person place or thing in the small group of words. For example Katy lives in the blue house. …the blue house. This is the noun phrase. Verb phrase – a group of words including the verb, a portion of a sentence as well as a direct or indirect object. It can be the predicate of the sentence. For example The big ship sailed across the ocean. ….sailed across the ocean. This is the verbial phrase. The adjective phrase – is the group of words that describe the noun. The adjectival phrase gives the sentence more colour. For example. The boy took his clever, bouncy dog Rover for a walk in the park. His clever, bouncy dog is the adjectival phrase. Prepositional phrases – these phrases are set right after the preposition. For example – The book on the table in the classroom belongs to Barbara. The prepositional phrase shows the relationship between the object and another word in the sentence. There is a catch to using phrases and a catch phrase! Firstly care needs to be taken when a writer uses phrases because bad use of phrases can weaken the power behind the work. Words like absolutely and necessary weaken the meaning of the phrase that could just as easily and as effectively expressed as a simple powerful statement. For example – It is absolutely essential to switch off the light and conserve electricity. One can also say – It is essential to switch off the light and conserve electricity. So don’t get caught out using lengthy phrases with weak words that detract from the power of your writing. Then the ‘catch phrase’ has a whole new meaning in the world of media and movie icons. A catch phrase attracts attention and can be associated with a product or a person or even a particular TV show. Different cultures can have catch phrases that identify with their particular shows and programmes. British television has coined phrases like ‘Is that your final answer’ from ‘Who wants to be a Millionaire’. The words are said by Chris Tarrant. Phrases and idioms are therefore part of the language structure and can be factual expressions taken literally or metaphorical phrases taken as part of the colloquial language. Phrases and idioms are there to enrich descriptions and the spoken word. They are the symbols of language that often distinguish the native speaker from the second language student. Wikipedia states that there are over 25 000 idioms in the English language. That is an enormous number of tricky little phrases to get to grips with. English idioms are so natural to most native English speakers that is hard to believe so many exist and often the native English student is unaware of the casual idiomatic phrase slipped into the written and spoken word. The phrase and the idiom are intrinsically linked to one another but definitely different when put under the microscope of language analysis. It is worth remembering to ‘look at the writing on the wall’ and decide for yourself if there is a possible danger of using idiom or phrases incorrectly and damaging your image in the writing or linguistic world. Christina Wither. "Difference between Phrase and Idiom." DifferenceBetween.net. October 9, 2017 < http://www.differencebetween.net/language/difference-between-phrase-and-idiom/ >.